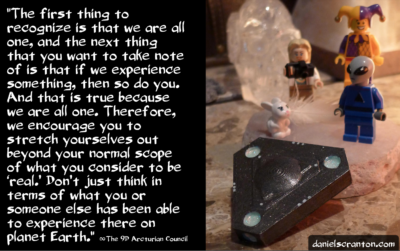 We have a wide array of experiences in our collective past, and these experiences have informed us as to what we would think would benefit the human collective. When we were physical beings, we traveled throughout the galaxy, and at times outside of the galaxy, in search of new philosophies, new ways of looking at existence. We have not stopped looking just because we no longer inhabit physical bodies, but when we were physical, we had experiences similar to what you are experiencing. But of course, ours were different because we have been on a different path. Now, each of you draws from your own experiences in developing your philosophies, your approaches to life there on planet Earth, and most humans tend to cling to those philosophies. We are talking about something here that is bigger than a belief. We are talking about a world view or a galactic view, something that you put a tremendous amount of time, thought, and energy into. And it would stand to reason that if you had more experiences, or different experiences, you would develop a different worldview. But what if you could only create experiences for yourself that fit in that worldview? What if you were only allowing yourselves to experience that which you or someone else had experienced previously? How could you remedy that? Well, the first thing to recognize is that we are all one, and the next thing that you want to take note of is that if we experience something, then so do you. And that is true because we are all one. Therefore, we encourage you to stretch yourselves out beyond your normal scope of what you consider to be ‘real.’ Don’t just think in terms of what you or someone else has been able to experience there on planet Earth. Expand out to include all beings in the galaxy, all beings in all dimensions, or even all beings in existence, and recognize that you can widen that scope. You can allow in more experiences than you can imagine, and it is as easy as letting go of the basis for that worldview. Anything you can imagine and so much more. That is what is available to you in this now moment.